When a dead rat fell out of the ceiling during Carolina’s two-touch warmup, Game 2 was essentially destined to be weird. 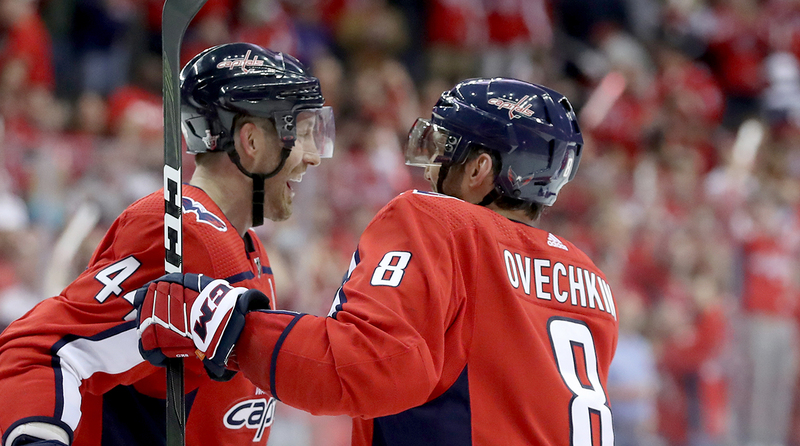 Washington came out on top of a back-and-forth, chaotic slugfest when Brooks Orpik–yes, the 16-season veteran who averages about a goal per year–scored in overtime to give the Capitals a 4-3 win and a 2-0 series lead. Evgeny Kuznetsov passed to the man they call Batya (Russian for “dad”) and Orpik’s one-timer got past Petr Mrazek, who was screened by his own player. It was Orpik’s fourth career playoff goal and his third playoff game-winner. The Caps came out quick yet again, taking a 2-0 lead before the midway point of the first, thanks to goals from Nicklas Backstrom and a fancy-footed T.J. Oshie, who kicked Justin Williams’s stick out of his way before backhanding a shot past Mrazek. Later in the period Braden Holtby did his best ballerina impression when he was contacted near the crease and the goaltender spun around before he could get set. Lucas Wallmark cleaned up the rebound to score and the Capitals challenged for goaltender interference, but to no avail. The oddities continued in the second period, which saw five of the game’s nine penalties, several belonging to Micheal Ferland. Shortly after serving a hooking penalty, Ferland was given a five-minute major and a match penalty for a hit on Nic Dowd, who returned later in the period. Coach Rod Brind’Amour was less than thrilled with the call, saying he didn’t think there was any contact with Dowd’s head. Carolina had its own injury scare when Mrazek took a John Carlson blast to the face, with his mask coming off in the process. The goalie was looked at by a trainer, but stayed in the game and made several impressive saves to keep the Hurricanes in it. Sebastian Aho tied things up at 2-2 late in the second, banking a shot off Holtby’s back and into the net. Washington regained the lead midway through the third with a goal from Tom Wilson and commanded most of the period until Jordan Staal redirected a shot from Dougie Hamilton and tied things up with five minutes left. Orpik settled things 1:48 into overtime and now we all wait to see if playoff Storm Surges will be a thing. The Predators dominated in scoring chances through the first 40 minutes, outshooting the Stars 29-15 in that span. But it was the Stars who first struck early in the second when Tyler Seguin sent a beautiful pass by a flailing P.K. Subban and in the perfect spot for Jamie Benn to knock into the net. Nashville answered two minutes later when Austin Watson had a nifty setup of his own, flicking a backhand shot from around the side of the net that bounced of a Stars defenseman and found the stick Rocco Grimaldi, who snuck it through Ben Bishop. Other than that two-minute span, stingy defense was the name of the game that saw five minutes of overtime before Craig Smith scored and busted out a sword-sheathing celebration that would put fear into the eyes of many in the Seven Kingdoms. This series already feels like it’s in Game 7 form. The Bruins came out with a ton of energy in Game 2 with Charlie Coyle the first to cash in, but it was the second goal that literally spun heads when David Pastrnak delivered a spin-o-rama pass to Brad Marchand. Toronto then generously gave Boston a gift in the second period when the Bruins third goal came off a miscommunication between Frederik Andersen and William Nylander. Andersen passed the puck off to Nylander, who mishandled it and left it next to the post for Danton Heisen to grab and score. And then things turned messy. Midway through the second, Jake Muzzin landed a huge hit on Torey Krug, whose helmet went flying as he awkwardly fell into the boards. Krug was helped off the ice and did not return to the game. Later, a nasty knee-on-knee collusion from Jake DeBrusk on Nazem Kadri sent the latter flying into the air and to the locker room. Kadri was back on the ice for the third period and scored Toronto’s only goal, tipping a Travis Dermott shot, but that wasn’t redemption enough for the Maple Leaf apparently. After DeBrusk hit Patrick Marleau into the edge of the glass near the bench, Kadri retaliated by skating straight up to DeBrusk and cross-checking him in the face. DeBrusk was motionless on the ice for a few moments, and Kadri was given a five-minute major and game misconduct, and will receive an in-person hearing, meaning he could see a suspension of five-plus games. The offensive firepower expected from this series seemed like it was dormant…until it wasn’t anymore. After a scoreless first period, Colorado struck first when Matt Nieto scored shorthanded on breakaway. Rasmus Andersson responded a few minutes later, but the top lines for both teams were relatively quiet for the game until Sean Monahan broke the tie after picking up a loose puck that Sam Bennet shot off Avs defenseman Erik Johnson. After pulling Philipp Grubauer with less than three minutes left, J.T. Compher tied it up for Colorado to set up the third overtime game of the day. Then the big guns really showed up as a full-speed Nathan MacKinnon rocketed a shot straight past Mike Smith’s shoulder and officially tied the series. Orpik is rarely going to be seen on any highlight tapes that don’t include monstrous hits and bug-eyed stares that could stop a heart with fear. Kuznetsov’s setup landed perfectly and Orpik just had to send it home to end this wild game. 1. Brooks Orpik, WSH — For the most defensive of defenseman out there, Orpik has a weird knack for coming through in the playoffs. Of his four playoff goals, three have been game winners, with two of those coming in overtime. 2. Craig Smith, NSH — This essentially came down to Orpik’s unlikely heroics and Smith’s outstanding celebration. Although Orpik edged him out, Smith’s goal is a beaut of its own, whacking at a bouncing puck that made its way through several bodies before finding the back of the net. 3. Nathan MacKinnon, COL — And in keeping with the theme of the night, we’re streamlining it with overtime goal scorers. MacKinnon’s was an absolute laser that just fits in with his freakish skill.